AC-PAAS The paAS speakers ystem is designe dfo rth Korg Pa3x and Pa4X keyboards. It has high quality sound and fits perfectly without the need for cables. 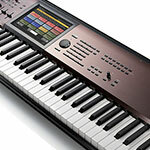 AC-EK50 The New Korg EK-50 Entertainer keyboard from Korg is designed for players of any level. Made to grow with you as you progress, with functions from single finger accompaniment styles to full keyboard functionality. The EK-50 has masses of Voices and style genres to suit everyones needs. Give us a call or pop in store for anymore information. 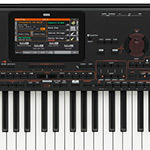 AC-KROSS2MB The powerful Korg Kross 2 61 note workstation offers top class sounds with many creative features. Finance available. 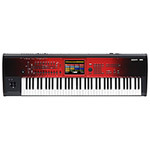 AC-KRONOS288 Korg KRONOS 2 88 workstation with RH3 piano feel keys and world class recording features and sounds all in one unit. Finance available on-line. 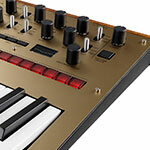 AC-Prologue8 The Korg Prologue 8 is a powerful analogue synthesizer combined with a new digital multi-engine system. 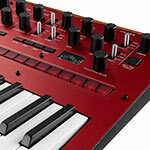 Limited offer now with Free SQ-1 sequencer. Finance available. AC-PA700Bundle The versatle Korg Pa700 embraces Korgs flagship keyboard technology offering high quality sounds and backing styles, combined with a great amplification system and colour touch screen interface. Bundle includes pedal, stand, stool and headphones. AC-Prologue16 The Korg Prologue 16 brings rich analogue sound to your music. Get a free SQ-1 during March. Finance available. 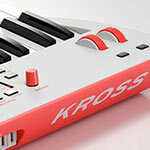 AC-KROSS2MBBundle The Korg KROSS 2 is a compact, lightweight and versatile synth workstation with incredible sound quality. Features include sampling, sample trigger pads, USB audio interfacing, audio recording and playback.Bundle includes stand, headphones and pedal. 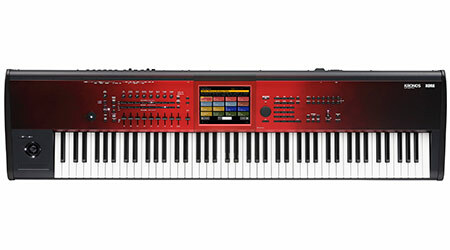 AC-KRONOS2 The Korg KRONOS 2 61 music workstation available on finance. 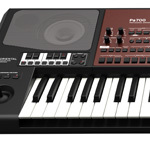 Spread the cost of the top of the line synth workstation with 9 different sound engines and powerul recording facilities. 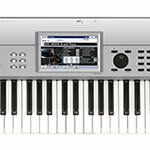 AC-KRONOS273 Korg KRONOS 2 73 Note Music Workstation is the flagship model from Korg with an incredible 9 sound engines and verstaile recording and editing features built-in. 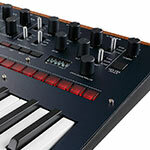 Free Korg Supercharge soundset and finance available. 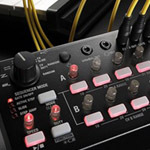 AC-EMX2-BL The Korg electribe EMX2-BL is a synthesizer-based production machine with analog oscillators, high quality PCM sounds, powerful effects and pattern recording all in a compact module. Export data to multi-track ableton files for super fast production capabilities. Speak to an expert in-store today. Finance available. 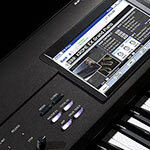 AC-PA4XOR The PA4X offers Korgs ultimate keyboard experience. The Oriental version covers all styles from from Western to Oriental including Arabic, Persian and Turkish. quarter tone tuning and a range of incredible quality sounds make the PA4X Oriental the professionals choice. Ask one of our experts for custom pricing and advice. 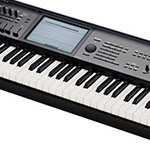 AC-PA4XOR-76 The PA4X 76 Oriental is a professional arranger keyboard covering all styles from from Western to Oriental including Arabic, Persian and Turkish. quarter tone tuning and a range of incredible quality sounds. Speak to a Korg expert today. Finance available. 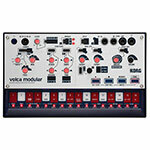 AC-volcamodular The Volca Modular makes modular synthesis more accessible and understandable ,offering 50 patch points and 8 modules to get creative with. AC-PA4XBundle The Brand New Korg PA4X 61 Key Keyboard. Bundle includes PAAS speaker system. AC-PA300 Korg PA300 Arranger Keyboard. 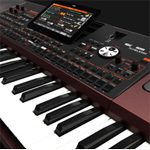 61 Note keyboard with with professional quality Korg sounds and hundreds of backing styles to choose from. Perfect for home keyboard players and gigging musicians. AC-NanoKontrol2Wht Compact, portable, programmable and versatile USB Controller. The NanoKontrol needs no PSU. It is powered by USB and can control almost anything in your favourite DAW. 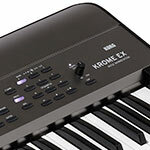 AC-KROMEEX88 The Korg KROME EX 88 offers an 88 note balanced action, expanded selection of sounds for modern styles of music and advanced recording features. Finance available. Part exchange your instrument. 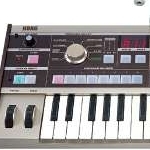 AC-KRONOSLS Korg KRONOS LS. 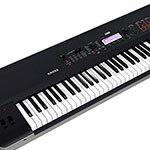 Optimised for organ and synth performance the LS model offers all the power of the KRONOS in a more portable 88 note format with semi-weighted keys and a great new look. 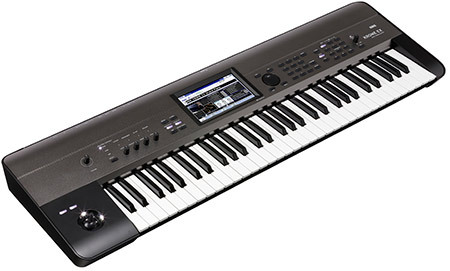 AC-KROME73PLATINUM Korg KROME-73 is a mid priced workstation with high end professional sound source, editing and recording capabilities. 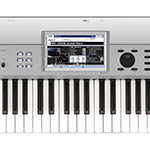 AC-KROMEPLATINUM Korg KROME 61 Platinum Workstation in a limited edition finish. Stunning looks to suit the top class sounds. Navigate and create using the colour touch screen. This is an all round fantastic workstation. Finance available. AC-PA4XORRF The PA4X offers Korgs ultimate keyboard experience. The Oriental version covers all styles from from Western to Oriental including Arabic, Persian and Turkish. quarter tone tuning and a range of incredible quality sounds make the PA4X Oriental the professionals choice. Ask one of our experts for custom pricing and advice. AC-KROSS288 Korg KROSS 2 88 synthesizer workstation - Portable workstation with 88 note piano action for a great playing experience. New features include high quality sounds, audio interfacing and new sampling capblities with trigger pads. Finnce available. 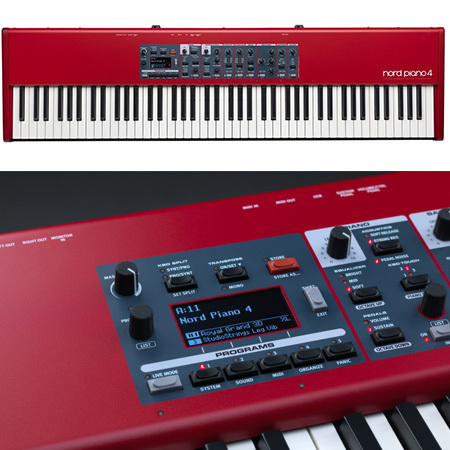 AC-KROSS2GR The limited edition Korg Kross 2 in Neon Red offer an expanded PCM sound source and stand out colour. 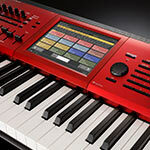 Its packed with a 16 track sequencer, audio recorder and player and even a sampler. finance available on-line. 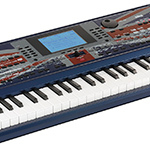 AC-KROSS2GB This Korg KROSS 2 special edition comes in grey with neon blue to stand out in any situation. 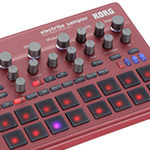 It incorporates the Korg EDS-i engine for high quality sound production coupled with a powerful sequencer, sampler, effects system and everything needed for performance and song creation. Finance available. 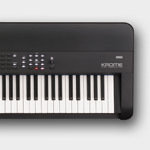 AC-KROMEX61 The Korg Krome EX features a new cabinet design and colour to complement the brand new sound sources. It has the high quality sounds everyone needs but boosted with a host of new PCM samples and sound selections that are essential for todays music scene. 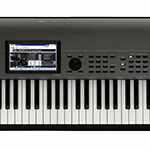 AC-KRONOS2SE61 The Korg KRONOS 2 SE Special Edition workstation adds a brand new Italian piano along with collections of KA Pro sounds added to the already huge sound selection. Finished in a stunning graduated red to black fade, it looks as sleek as it sounds. AC-KRONOS2SE73 A brand new Italian piano, newly expanded KA Pro Showcase sounds and a beautiful red fade metal casing set the KRONOS 2 SE 73 apart from the standard model. Finance available on-line. 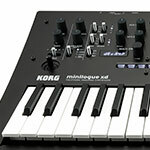 AC-miniloguexd The Korg Minilogue XD expands on the original model with a new digital multi-engine, effects, boosted sequencer and micro tuning capability. Finance available. AC-KROMEEX73 The KROME EX 73 offers superb selection of new sounds and has a new dark grey aluminium panel re-design. 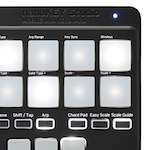 A powerful 16 track MIDI sequencer is built for compelte song creation. Finance available. AC-NanoKontrol-Bk A versatile 8 channel USB controller perfect for integration into any homestudio or DAW system. 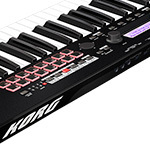 AC-KROSS2MBRF The Korg KROSS 2 offers exceptional value for money. High quality sounds, sampling, sequencer and audio recording amongst its facilities. Our Ex-Demo model is perfect condition with original box and full manufacture warranty. 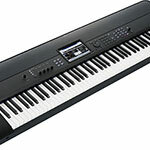 AC-PA1000Bundle The Korg Pa1000 arranger keyboard is an ideal profesisonal quality instrument for any level of player. 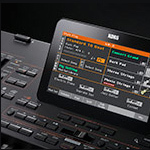 It has a large colour touch screen, fantastic amplification and hundreds of sounds and styles as standard. 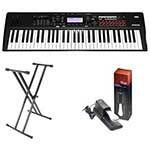 Korg bundle includes stand, headphones, stool, and pedal. 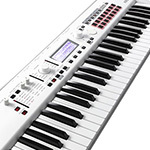 AC-KROSS2WH The Korg KROSS 2 is now available in a limited edition white finish. This compact synth workstation offers an unbelievable amount of features, high quality sound and capabilities you just would not expect from such a portable product. Finance is available. 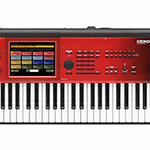 AC-KRONOS288SE The KRONOS 2 88 Special Edition has a stunning red fade top and enhanced sound set with new pianos and world class sounds. Part exchange and finance available. AC-MICROKORG-S Korg MicroKORG-S features a built-in 2+1 speaker system, increased memory and new programs to play with. 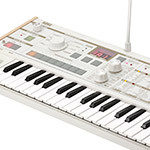 This compact yet versatile minikey synthesizer offers incredible synth sounds but is also equipped with a fantastic vocoder for classic vocal effects. AC-VolcaKeys Compact sized true analogue synthesizer with 3 oscillators and electribe style step sequencer. In-built speaker allows instant gratification of use. 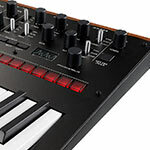 AC-MS20 Korg MS20 Mini faithfully recreates the classic original MS20 synth using the same circuitry and patching system at 86% of its original size. AC-Monotron-Duo The Monotron Duo advances on the original Monotron with dual oscillators and a new scale function as found in the Kaossilator series products. AC-Monotron-Delay The Monotron delay adds a fresh dimension to the popular Monotron. New waveform selection mode and a space echo bring the best out of this tiny synth. AC-Taktile49 Versatile 49 note controller keyboard with Kaossilator style X-Y grid, built in arpeggiator, velocity sensitive trigger pads and assignable switches and sliders. 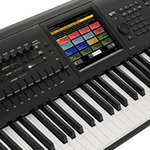 AC-MicroKey61 The Korg MicroKey 61 has velocity sensitive mini keys and comes bundled with the Korg Legacy Collection Software including polysix, M1, MS20 synths and more. 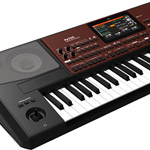 AC-Microkey25 The Korg MicroKey 25 is a super compact 25 mini key USb controller keyboard with plenty of features for superb DAW control anywhere, anytime. AC-NanoPad2Wt The NanoPad2 is an incredibly versatile USB pad controller with a large number of 16 velocity trigger pads and a large X-Y pad for controlling effects and more. AC-NanoPad2Blk Compact in size and big on features the Korg NanoPad2 is a nano sized USB pad controller with 16 velocity sensitive pads and an X-Y control pad. 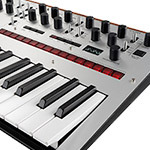 AC-MICROKORGXL+ In the next evolutionary step of the Microkorg species, the new MicroKorg XL+ delivers a fresh update to the sounds and design of the MicroKorg XL, making it the ideal compact keyboard. 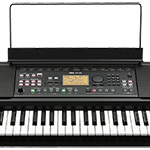 AC-MicroArranger Korg MicroArranger - compact 61 mini key arranger keyboard. Turn your musical thoughts into musical reality. 304 styles and 660 sounds built-in for all your musical needs. AC-VolcaBass True analogue bass synthesizer with in-built looper. 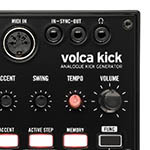 The Volca bass is compact and ready for sonic bass meltdown. 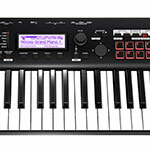 AC-KROME Korg KROME 61 Workstation A superior sound pallet and versatile sequencing system, the Korg KROME is a 61 note workstation with ultra-powerful technology at a budget price..
AC-VOLCA-KICK A powerful kick synthesizer that even covers kick bass generated by by MS-20 filter oscillation. 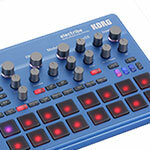 A perfect addition for musicians who already own other products from the Korg Volca range. 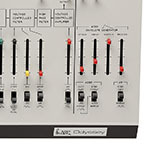 AC-ESX2 Korg Electribe Sampler ESX2 workstation with hybrid synth engineer with sampling technology for creating patterns with intuitive beat making, advanced step sequencer and versatile effects. 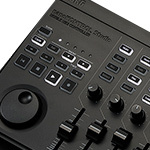 AC-NanoKontrolStudio A compact MIDI controller offering a transport section and mixing controls for effortless control over your DAW or the MIDI devices. 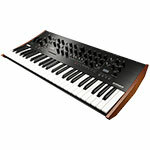 Korg experts in store - call today. AC-NANOKEY-ST An all-in-one that delivers inspiration. A mobile MIDI keyboard that connects via USB or wirelessly. The nanoKEY Studio provides a keyboard, knobs, trigger pads, and touch pad that lets you instantly convert your inspiration into sound. AC-LIVERPOOL Immerse yourself in the classic 60s music of Liverpool with the famous Lennon and McCartney songs. 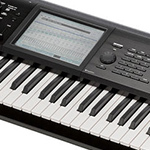 The Korg Liverpool keyboard offers 100 built in Lennon and McCartney songs to let you jam along but there are also styles for the songs built-in for you to play in your own way. AC-SQ1 SQ-1 Is a compact hardware step sequencer with MIDI and CV connections. Connect to MS-20, Volca and other products. 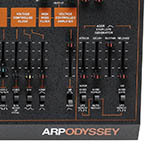 AC-ARPODYSSEY 2015 version of the famous ARP ODYSSEY. Redesigned by Korg at 86% of its original Size. Get legendary sounds with a modern twist. 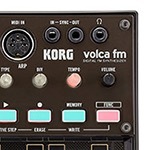 AC-VolcaSample Korg volca sample - create and edit live sequences with audio samples in realtime. Perfect addon to the Volca series. 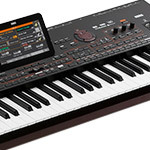 AC-KROME73 Korg KROME 73 synth workstation ultilises Korgs incredible sound technology, a large touch screen interface and great seqeuncing capabilities. A great all round synth workstation. Finance available. 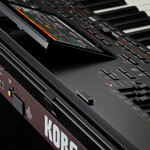 AC-KROME88 Korg KROME 88 note workstation. 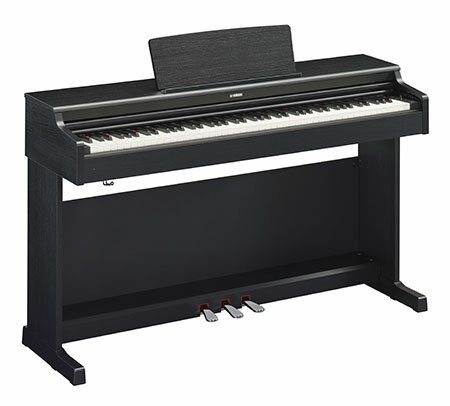 Feature rich, 88 note piano action workstation with stunning vivid sounds and versatile recording capabilities. Finance available. 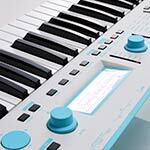 AC-MicroKorg The Korg Microkorg is a powerful synthesizer and vocoder in a small package. 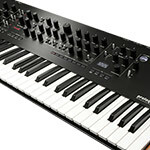 With 37 mini-keys the Microkorg is possibly the most powerful tiny synth on the market.